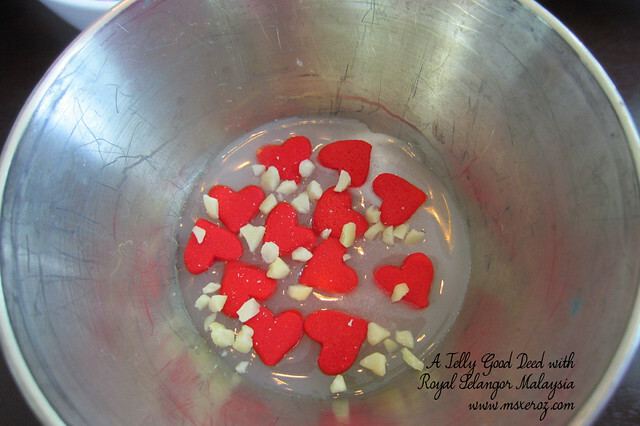 Jelly + Breast Cancer Awareness + Pewter makes any sense to you? Well, you are not the only one thinking like that. 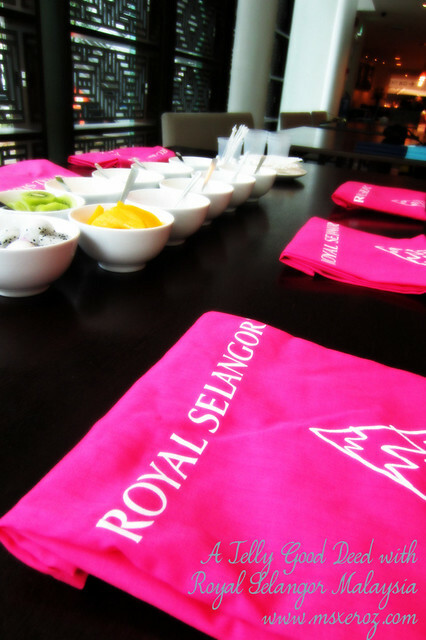 It was my first time knowing about Royal Selangor Malaysia's activities for the month of Pink October that is dedicated to raise awareness and funds for Breast Cancer Welfare Association of Malaysia. 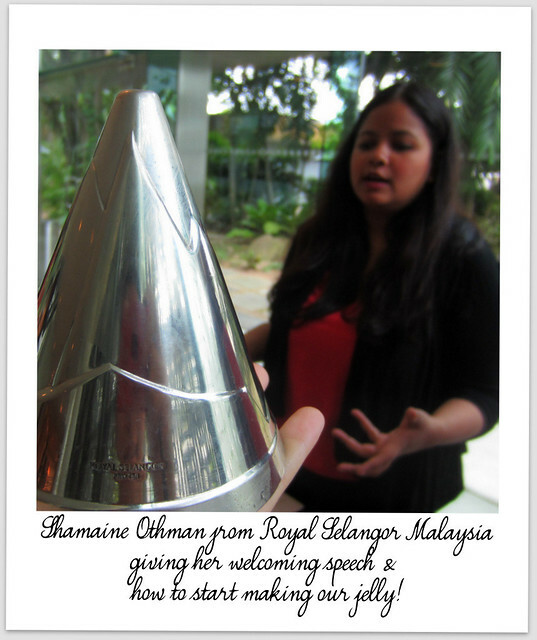 This program or workshop was initiated since 2006, and I begin to suspect that I live in a cave because I never knew that there is such workshop by Royal Selangor! 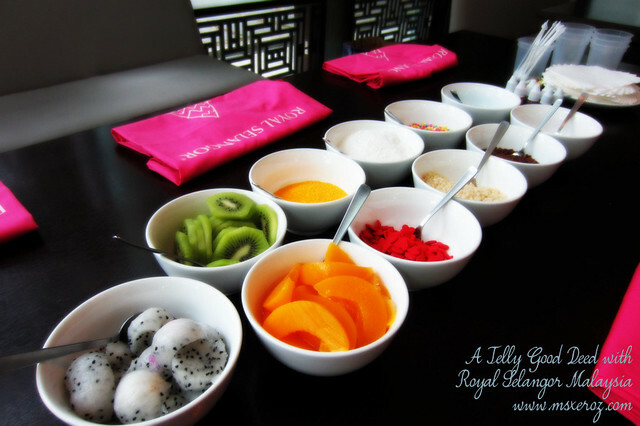 How does the workshop help in instilling breast cancer awareness? 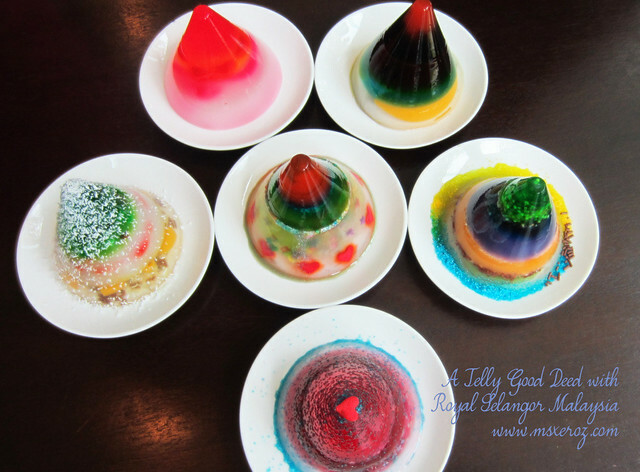 Royal Selangor Malaysia will donate EVERY RM100 from purchase of each jelly mould (RM290). 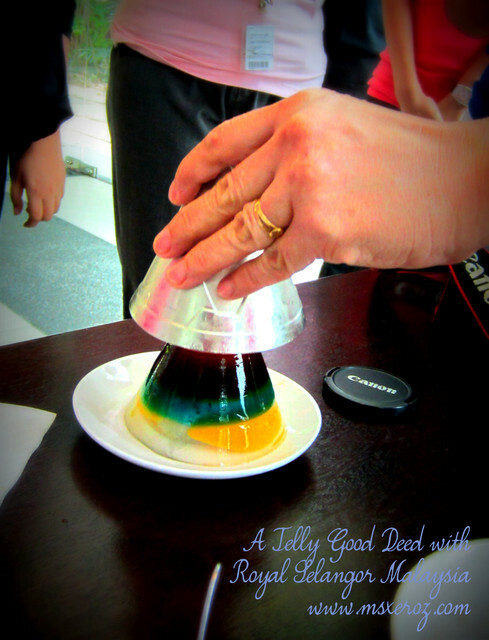 Not only that, buyers will be able to participate in Jelly Making Workshops every Saturdays in October 2012 with LOCAL CELEBRITIES. Yupz, you got me right. 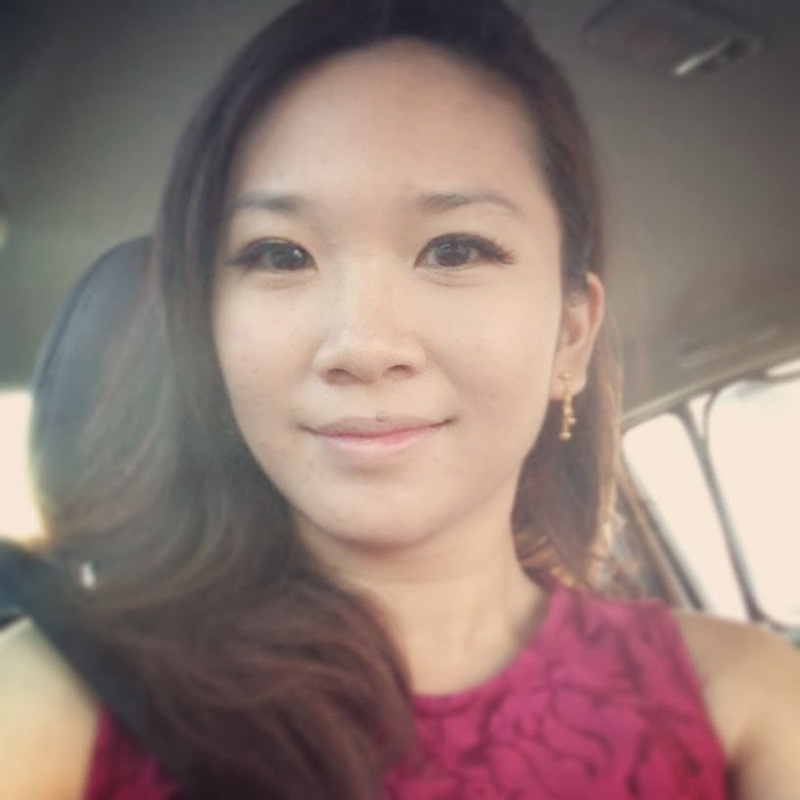 Local celebrities like Elaine Daly, Patrick Teoh, Deborah Henry, Lee Khoon Hooi, Kuah Jen Han and even non celebrities like the famous fashion designer Melinda Looi and Chef Anis Nabilah will be hosting the weekly workshops. So imagine this. 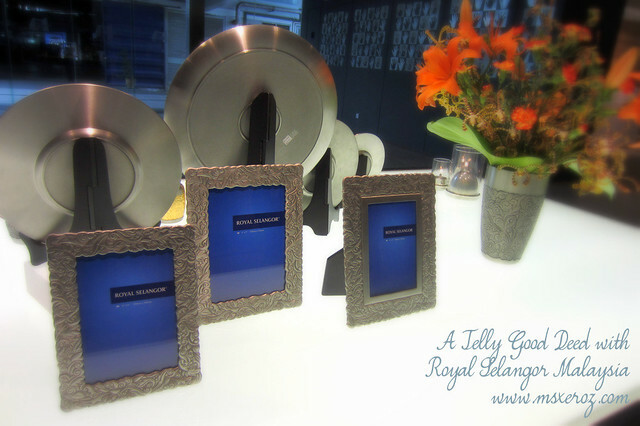 Buy a Royal Selangor Jelly Mould pewter that allows you to do charity, that is also a ticket for an interesting jelly-making workshop, plus hosted by celebrities! 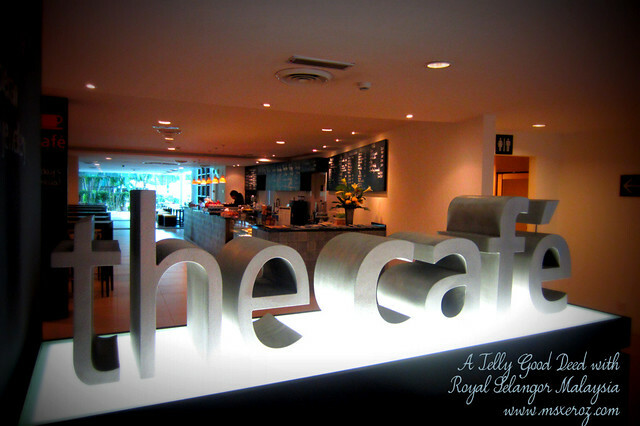 WOAH~ it's amazing right? 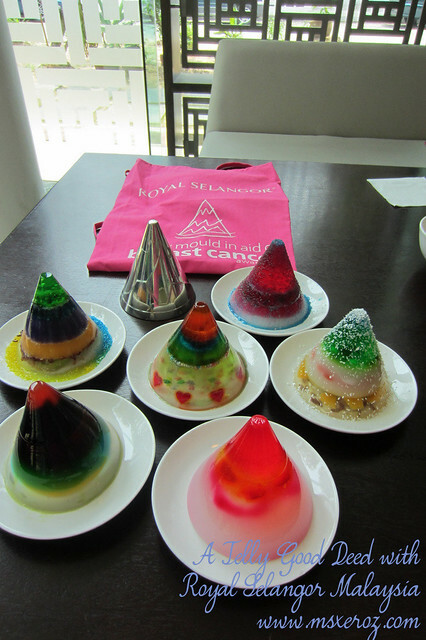 The Jelly Making Breast Cancer Awareness workshop took place at The Cafe located inside the Royal Selangor Visitor Center. Upon arrival, the sight of the well-prepared and varieties of condiments excites me! I can't wait to start! 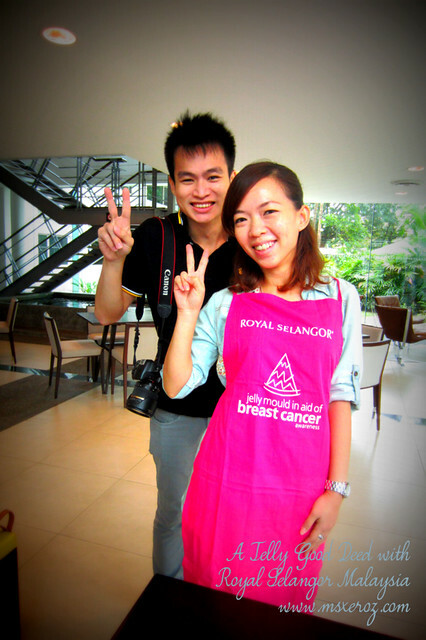 Not only that, we are provided with PINK APRON to secure our clothes from any spilling or dirt from the workshop! PINK is my favourite colour! Oh ya, guess who is here with us? 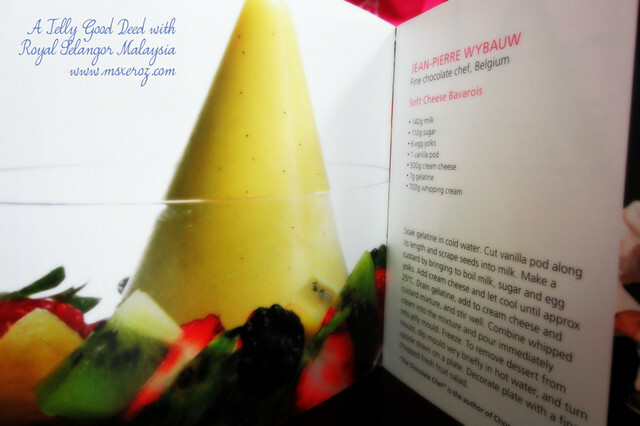 Kampung Boy & City Gal! Look who is here as well! 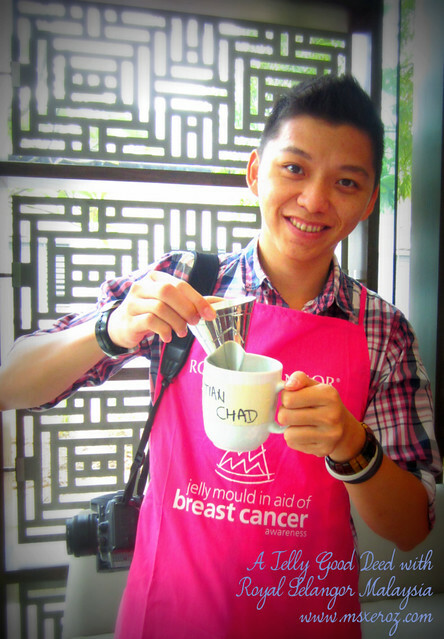 Global Blogger TianChad cares for a healthy breast BWAHAHA! 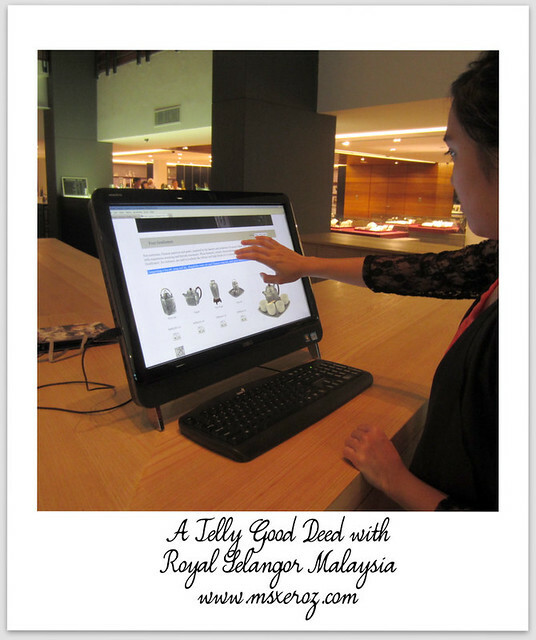 and of course we were given a crash course on why and what this workshop is all about. 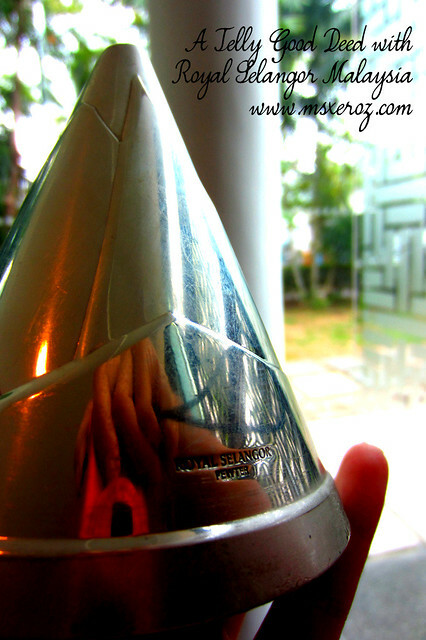 And if you are wondering, why is it conical shaped? 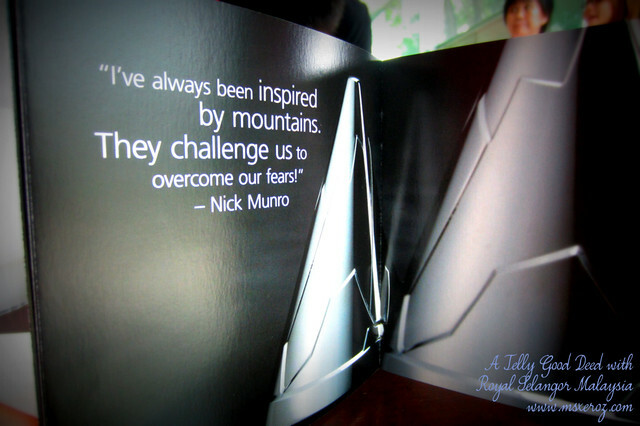 Here's the answer from the designer, Nick Munro! Overcome our fears we must, and we will succeed in whatever we do. 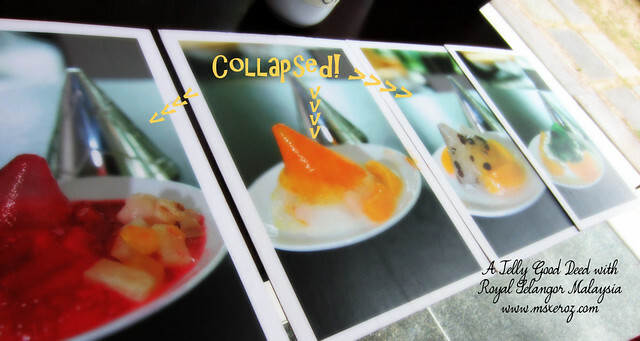 I fear of my jelly failed to take form! 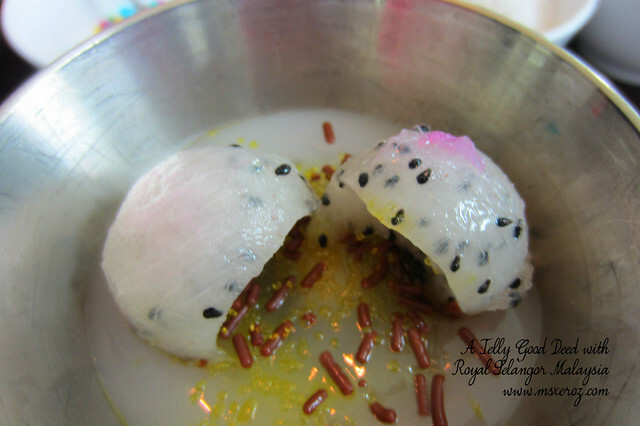 "We should love our life more, and take good care of our health"
And I put in two balls of dragon fruit, depicting a woman's mountaineous breasts. LOL JOKING! 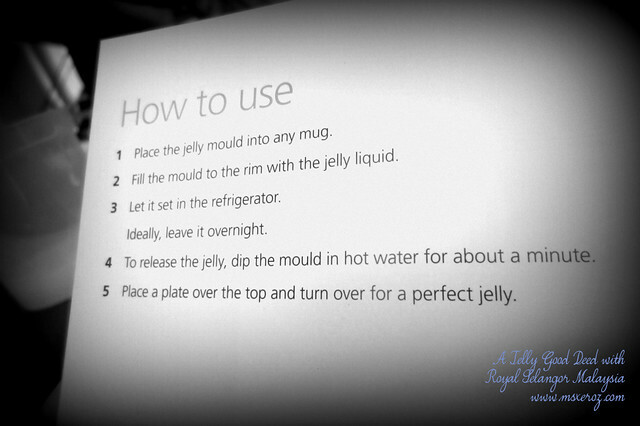 and also some basic instruction steps and how to keep your jelly mould proper. 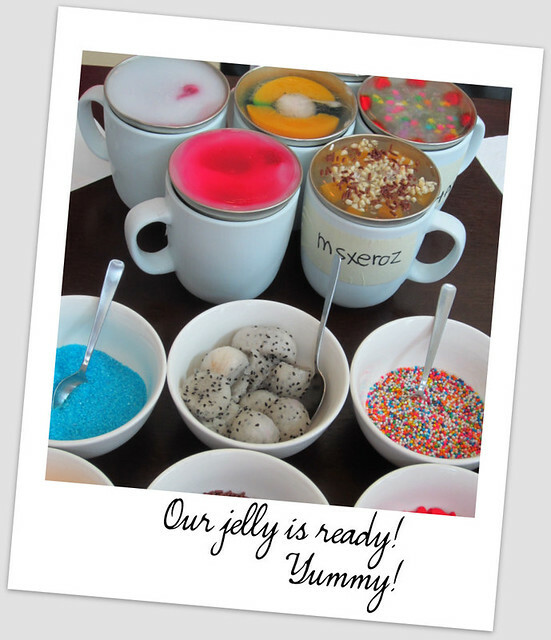 Owh~ our jellies are done and set. But we need to get it out from the mould. 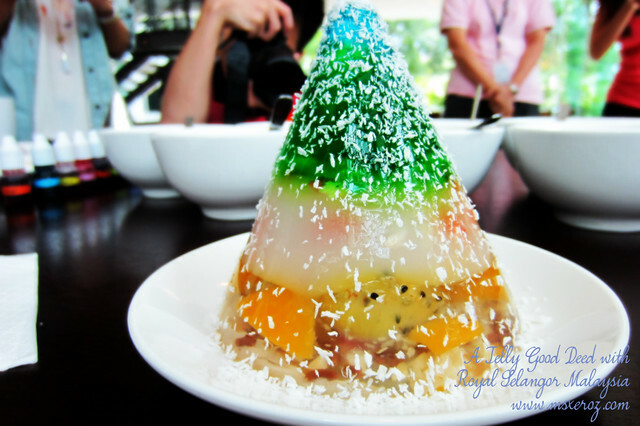 Here's my Snowy Mountain Crazy Jelly~ made solely, entirely and exclusively by MsXeROz! Help me share and "like" my blog post so that this message can be pass out and more people to be aware on this workshop and charity event.